Strategy workshop on alumni relations in Washington, D.C.
Travel stipends to Washington D.C. for international alumni to contribute to the worldwide Hertie School Alumni network. 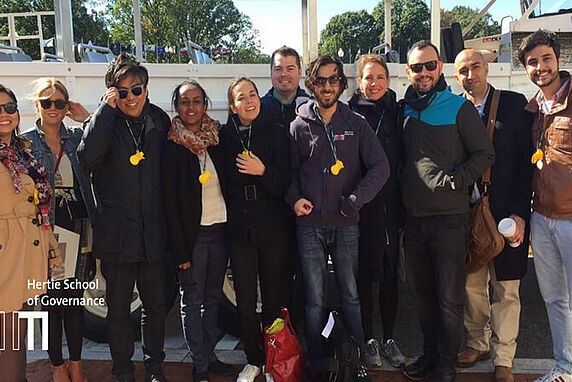 This October, just a few weeks before the historic US elections, ten international alumni from the Hertie School travelled to Washington, D.C. to discuss strategies on improving and strengthening the Hertie School Alumni network. With the generous support from the German Academic Exchange Service (DAAD) we organized a two-day workshop and a networking event with the broader DC alumni community. The workshop took place on the premises of New America, where alumna Alieza Durana kindly hosted us. Alieza provided us with insights into the impressive work of the think tank and the important role it plays in America’s public discourse. The workshop provided us with feedback on our Ambassadors programme and on how to improve alumni relations at the Hertie School in general. We received concrete suggestions on how to utilize digital social networks more, and how to be more proactive about reaching out to our international alumni. One of the key conclusions was to establish regional hubs for Hertie School Alumni. Over the weekend concrete ideas and next steps were developed for this project, which is now spearheaded by the MPP Alumni Council. We also took the opportunity to visit and network with some important organisations in Washington, D.C., such as the Friedrich-Ebert-Foundation, the Heinrich Böll Foundation, the World Bank, and the Inter-American Development Bank. We visited the McCourt School of Public Policy, our partner school at Georgetown University. These were great opportunities to learn about other approaches to alumni relations, to discuss current policy issues, to find out more about career opportunities and to enable our alumni to network further with institutions and people with similar interests. Another highlight was the networking night with alumni and students currently based in Washington, D.C. We were happy to see that there is such an interest to reconnect and engage with the Alma Mater. Not only was the event a great opportunity to share old memories, it also provided a platform to meet new and inspiring fellow alumni or to meet someone, who might be a door-opener for a next career step. All in all, we benefited tremendously from our meetings and the exchange with our international alumni community. Once again we became aware of how valuable our alumni network is, with it being made up of so many inspiring and interesting people. We came back full of ideas and fully motivated to develop our next workshop that is going to take place before the next Alumni Reunion in April 2017. So stay tuned, apply, and engage. We are always happy to hear your ideas and learn from you.